Definitions and examples of Appendix Ultrasounds are presented in two views. An ultrasound of the appendix uses high frequency sound waves to create a live image from inside of a patient’s body. It is a painless test that is very commonly used in the medical field today. An ultrasound is also sometimes referred to as a sonogram, diagnostic sonography, or ultrasonography. The medical professional that performs an ultrasound is called a sonographer. As an ultrasound uses sound waves rather than radiation, it is regarded as being a safe scan. Because of this, it is the preferred method to use during pregnancy. An ultrasound diagnoses problems with internal organs, blood vessels, and soft tissue structures within the body. Although generally associated with being used during pregnancy, an ultrasound is used to examine many other parts of the body including the gallbladder, liver, kidneys, pancreas, bladder, and many other internal structures. An appendix ultrasound can be used to guide doctors or surgeons during a procedure, such as a biopsy. They are important in planning for certain types of therapy and surgery, as well as in the aftermath to determine whether the patient’s body is responding to treatment. An ultrasound of the appendix is used to examine abnormalities in or around the appendix. An appendix ultrasound can be used to diagnose and examine an enlarged appendix with wall thickening, known as appendicitis. An ultrasound of the appendix can diagnose various infections, inflammations and tumors. 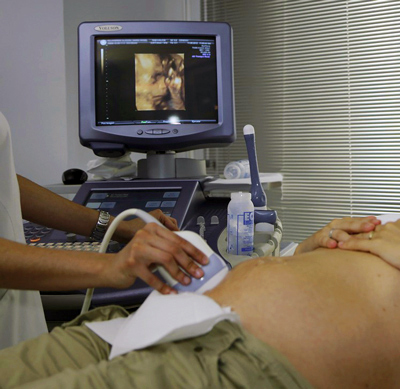 Above: Patient receiving an ultrasound test.